When aliens invade our minds, only a machine can save mankind! Stars Shellie Sterling (Army of Frankensteins), Madison West (The Neighbors), Mark Valeriano (Ted Bundy Had a Son), Jennifer Lee Wiggins (I Am Omega) and Sallieu Sesay (End of the World). From cult-favorite movie writer / directors “The Kondelik Brothers” (Behind the Walls, The Horde, Abraham Lincoln vs Zombies)! Comp to other DTV titles Future World, Alien Showdown, Occupation, Inferno: Skyscraper Escape and Beyond White Space. 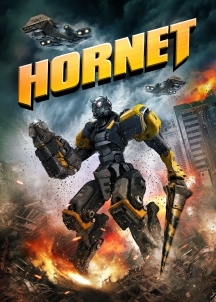 PERFECT movie for fans of the smash hit Transformers franchise and the upcoming Bumblebee! The robot is likeable, the acting from everyone is actually great... genuine moments of humor and tension... never a dull moment.